Provoked By Trump, The Religious Left Is Finding Its Voice The Trump administration has inspired a new activism on the part of liberal religious groups. Like the Moral Majority of the 1980s, they fear an assault on their most basic Christian values. "We believe that faith has a critical role to play in shaping public policies and influencing decisionmakers," says the Rev. Jennifer Butler, an ordained Presbyterian minister and founder of the group Faith in Public Life. "Our moral values speak to the kinds of just laws that we ought to have." I think religion helps people understand who they should be. "I think religion helps people understand who they should be," Butler says. Comparisons to the origins of the religious right are inevitable. The Rev. Jerry Falwell founded the Moral Majority movement in 1979 to oppose abortion and gay rights and promote private Christian schools, largely in the South, during a time of cultural change. "What motivated the religious right to begin organizing was a feeling of loss," says Henry Olsen, a senior fellow at the Ethics and Public Policy Center. "They felt the deepest values from their religion were being taken away from them." Religious voters on the left now see a comparable assault on principles they hold dear and are finding a new determination to defend the values of their faith, as they understand them. "To me, Jesus talked about reaching out to the poor, reaching out to the marginalized, reaching out to the oppressed," says Tara Agnew Harris, 41, who worships at Myers Park Baptist Church in Charlotte, N.C.
"Sometimes, I feel that traditional Christian beliefs have been hijacked," she says. "I think many people in the United States, when they hear about 'Christian beliefs,' they think it has something to do with a certain fundamentalist mindset." The way that I personally interpret my Christian faith and my own Christian walk is that it's an active challenge. [It's about] how I can make a difference in the lives of others. Tara Agnew Harris, member of Myers Park Baptist Church in Charlotte, N.C.
Harris in recent months has been exploring "immigrant injustice" issues and traveled with other Faith in Public Life activists to the Stewart Detention Center in Lumpkin, Ga., where undocumented immigrants were being held. She says her newfound interest in activism comes from her understanding of what it means to be a Christian. "The way that I personally interpret my Christian faith and my own Christian walk," she says, "is that it's an active challenge. [It's about] how I can make a difference in the lives of others." 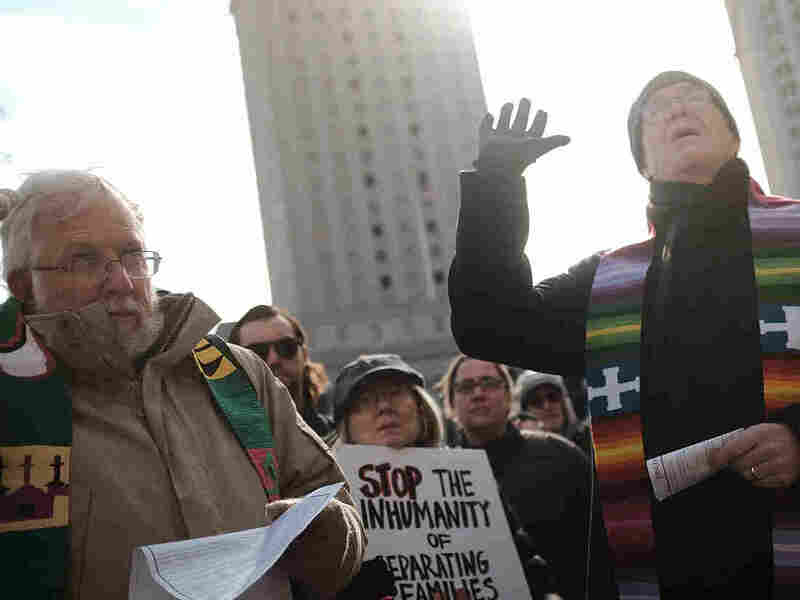 Butler's Faith in Public Life movement in recent months has organized a series of rallies to protest the Trump administration's detention of migrant families and the president's plan to build a wall along the U.S.-Mexico border, moves that Butler sees as conflicting with biblical teachings. "There are over a hundred verses of Scripture that say we are to welcome immigrants and welcome strangers," Butler says. "[Faith in Public Life] is driven by our moral values and not by politics." The religious left, having been largely eclipsed in recent years, has a ways to go before it can match the clout of the religious right. Butler's group and those allied with it have primarily kept their focus on protest rallies and social media campaigns. Conservative religious groups, with 40 years of organizing experience, conduct sophisticated campaigns in support of those candidates whose views align with their own. In his book The Four Faces of the Republican Party, Henry Olsen says conservative evangelical Christian voters demonstrate "unusual strength" in Republican presidential contests, especially in caucus states. While the Moral Majority organization was disbanded in 1989, the religious right is still active through such groups as the Faith and Freedom Coalition, which prepares voter guides spelling out candidate positions on such issues as abortion and gay marriage. "We distribute those voter guides, door to door," says Virginia Galloway, a regional director, based in Atlanta. "We distribute them through the mail. We go to rallies and hand them out, and then people take them home and share them with their friends." The Faith and Freedom Coalition has an army of trained volunteers at its disposal and access to sophisticated technology. "When I started," Galloway says, "we had a clipboard and a piece of paper with names of voters on it. Now we have an app on our phone. It will even give us directions to the next house." While many black churches have mounted voter registration drives in recent years to help get out the vote for Democratic candidates, the left does not have a level of organization matching that of religious conservatives. "The religious right has been talked about a great deal over the years," says Alan Cooperman, director of religion research at the Pew Research Center. "We found when we tested this back in 2010 that a substantial number of Americans said they have heard of the religious right. A majority of Americans said they had not heard of the religious left." A major disadvantage for any faith-based movement on the left is that it draws on a smaller base. Surveys show that liberals are less religious than conservatives by such measures as belief in God, church attendance or the importance of faith in their lives. Fewer than a third of liberals say they have "a great deal" or "quite a lot" of confidence in organized religion. Nearly half of liberals under 30 have no religious affiliation. Perhaps for that reason, the political agenda of the Faith in Public Life organization and other groups on the religious left at first glance doesn't seem all that different from that of groups on the secular left, such as MoveOn.Org. In contrast, the religious right has a more unique identity, with an evangelical Christian agenda that secular conservatives don't necessarily share. "The secular right may agree on some issues," says Henry Olsen, "but they are primarily motivated by a concern about what they would argue is the growing power of government. They are more interested in preserving the Constitution than the Bible." There are nevertheless some factors that may favor the religious liberals, in Butler's view. The religious left has, for example, a greater interfaith emphasis, incorporating progressive Catholics, mainline Protestants and some evangelicals, as well as non-Christian traditions. "We're working with Muslims and Jews and Sikhs and every sort of faith group," Butler says. "We all have the same core values in mind, which is that everybody is created in the image of God, and we need to love our neighbors as we love ourselves." At a time when the United States is increasingly diverse, such a multifaith approach makes sense. Religious liberals also bring at least one value that the secular left, in Butler's view, may lack: a commitment to bridge building. "A lot of folks on the secular left are a bit reticent to form common cause with people who see things differently on an issue," says Butler. "When it comes to reproductive rights and health, for example, we've been able to form alliances between people who are pro-life and pro-choice, because all of us agree there's common ground in wanting to reduce the number of abortions in the country." Jesus, a brown-skinned Palestinian Jew, called us to preach good news to the poor, the broken, the bruised, and all those who are made to feel unaccepted! With many Democrats worried that identity-based politics might fragment their base, a movement committed to forming alliances across identities should be well-received. Activists on the left should welcome the emergence of a religious core in their ranks because when political activity is morally inspired, it becomes more passionate — as conservatives already understand. Liberals are famous for being cerebral. A religious left may bring more energy to the progressive movement. Democrats got a jolt of that passion at their last national convention with an appearance by the Rev. William Barber, an African-American preacher from North Carolina who started the "Moral Monday" movement in that state. "Jesus, a brown-skinned Palestinian Jew, called us to preach good news to the poor, the broken, the bruised, and all those who are made to feel unaccepted!" Barber thundered, bringing the delegates to their feet. Describing himself as "an evangelical Biblicist," Barber said the nation is need of "moral defibrillators" to work on its weak heart. "We must shock this nation with the power of love. We must shock this nation with power of mercy. We must shock this nation and fight for justice for all!" Barber said, in the most rousing speech of the convention. Barber has since launched a new Poor People's Campaign and is now a key partner in Butler's Faith in Public Life coalition. The two often show up at rallies and demonstrations together, walking arm in arm, both wearing their clerical collars.